I like the fact that now that I’m “mature” I no longer feel the need to act my age. I think when you’re younger you try to act “older” to be taken more seriously, especially in the workplace. But once you reach a certain age where you’ve proven yourself, you have the luxury of being as silly as you like. And that’s a good thing! I do enjoy the discounts I get at the movie theaters though. I wore a chef’s uniform for years because I was in the food industry. There weren’t a lot of cool ways to style that kind of outfit, let me tell ya. It has been such a joy to have a job where I can wear things I love all the time. That mod print is fab. I’ve got a 60s dress that is similar. I’ll do a post on it someday so you can see. It always amazes me how alike our tastes are. I was definitely a rebel when it came to my work. Of course, when I was a student, we had to wear those awful lab coats, but once I became my own boss, I said forget that!! Needless to say I pretty much had to wear pants to work. When I’d try wearing skirts, it was hard to straddle the chair and be up close to the patient!! Love your dress, Suzanne—it totally reminds me of some my grandma used to wear, and now my cousin has them!! Glad I remind you of your Grandma! Ha ha! Your cousin is lucky. They had a party when I left. Ha ha! They did say that everyone would be sad not to hear my laugh daily. I had no idea I laugh so loudly. You know it’s probably a good job the charity shops in the UK don’t offer ‘Seniors’ discount because I’d have an even worse habit than I already have! I used to be a nurse many years ago and had to wear the starched apron and cap and even a cape. I loved it. Then in the 80s or 90s they went over to a ‘national’ nurses outfit where everyone looked like they worked in a bakery! I love your orange psychedelic dress. I love your description of the uniforms. It is true! They do look like they work in a bakery. Now over here nurses wear scrubs and they basically look like PJs. Do you have photos of you in the older uniform? I’d love to see them. A cape no less! Isn’t vintage awesome? I hope to see some of your collection. Having been a teen in the 60’s means I can really relate to this dress. I do have to say it would have been MUCH shorter in those days!! I can’t believe that we also wore garter belts and hosiery for much of the 60’s. NOT CONVENIENT!! Tights were worn more beginning around 1968. 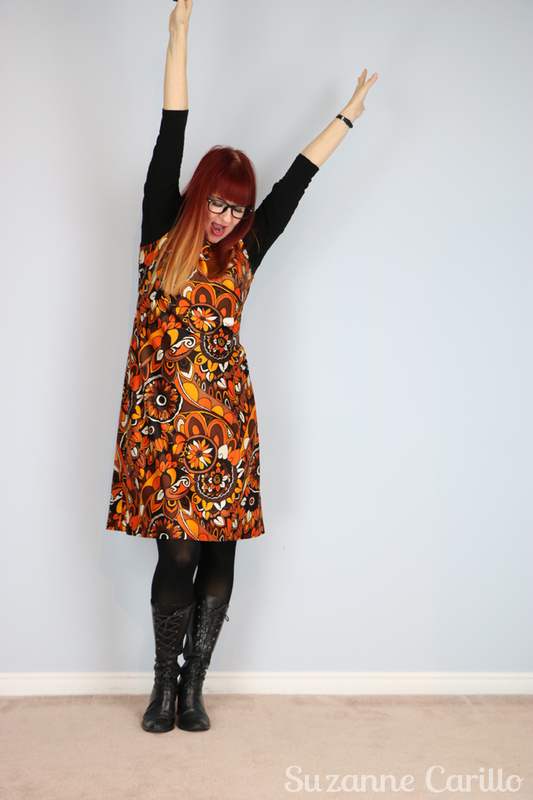 You look so happy in this groovy little dress Suzanne!! 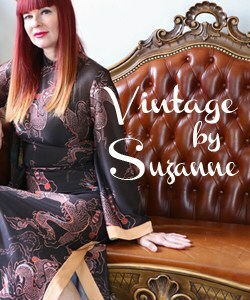 You definetly have a vintage soul girl!! DON’T GROW UP! IT’S A TRAP!! HA! I need that t-shirt! I will freely admit that I hoard boots. They are the most comfortable for me to wear. I think we’re so very lucky not to have to wear a uniform to work anymore. I used to work in a bank and had to be so formal I thought I might loose my identity altogether. 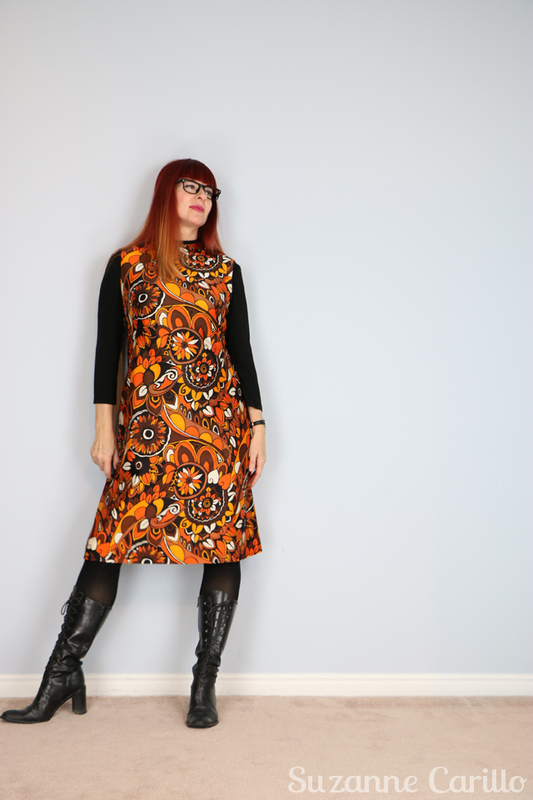 This dress is fabulous, very groovy baby and encapsulates every joyful thing that makes you, you. I love it. Thank you for your endless stream of inspiration, ideas and general disrespect that cheers my heart. One day I will be part of your little cotterie and join you on a meet up somewhere – that’s my dream. Yes one day we must meet Anna! Maybe you’ll come over for the meet-up later this year in New York? I don’t have the details yet but I think it will be early September. You went from working in a bank to working in an art gallery. Quite a jump…and for the better I might add. I’m always amazed when creative people are able to do desk jobs. You look groovy indeed! 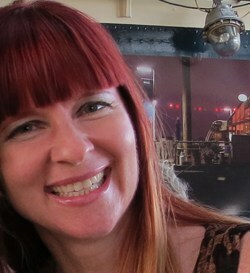 I love the way your hair color looks rebelliously matchy-matchy with your dress. Your spirit is contagious and I hope that I can continue to foster that in myself. I try to practice daily growing out of my comfort zone with weird clothes but some days I’d rather just blend in with the sea of blah clothes. Personal style is definitely a wild journey! I agree totally that some days I put on a baseball cap and hide. It’s not difficult and very easy to do. It is much more challenging to stand out than blend in. You hit the nail on the head when you described it as “personality erasing”. That is exactly how it felt. I would hate to be in a job that required me to wear a uniform. I rebelled against wearing school uniform whenever I could (which frequently got into trouble). I’m very grateful that I can wear whatever I want at work (the men often wear shorts and sandals in summer) although I do like to dress smartly. I’m freelance so I don’t work regularly and if I didn’t make the effort for work I’d spend my life in jeans and have a wardrobe full of unworn clothes. Gorgeous dress, and I absolutely love your hair colour! It is true that working from home doesn’t give me a chance to wear as many of the lovely clothes as I’d like. Then again working on whatever I want whenever I want has its benefits. I think the best thing about aging is a fabulous ‘who cares’ attitude (probably it is the one good thing I could find, but, once more, who cares!!). Love your dress, love all that funky style and cool boots! And I’m one of that lucky persons who work in a really relaxed atmosphere, where I’m used to wear whatever I like. 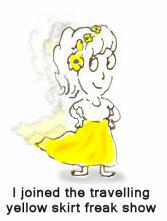 I’ve worn tye&dye skirts, sandals, straw hats, and all kind of fascinators, without receiving a comment. Really relaxing! I found that when I was in Spain so many of the people wore wonderful bright clothing. It is such a refreshing change from North America. “They say” that you’re taken more seriously and people want to do business with someone who is dressed conservatively, a suit maybe, neutral color, no bright color or flash. Who are these troublemakers who spread these opinions? I hear the logic, but in my heart, it doesn’t make sense and I can’t believe it. It says that people are so unthinking that they would trust a banker or their child’s teacher more because they’re wearing solid black, gray, or navy. Whatever the clothes (or any outward appearance), I think people can be aware of the banker/teacher’s intelligence and sincerity, their warmth and value to the situation. My own breaking point with my 1st job was during college as a telephone operator. We sat on backless stools very close to those on each side, in a long row of operators facing the long connection board. We couldn’t speak to each other, look around, hold a pencil in our hand, get up, or say anything other than what was written on our script guide. There was the allowed phrase for when you said you’d find the number, another phrase in a few seconds, a different phrase a few seconds later, etc. A supervisor was listening in on all our calls all the time and reporting any deviations. 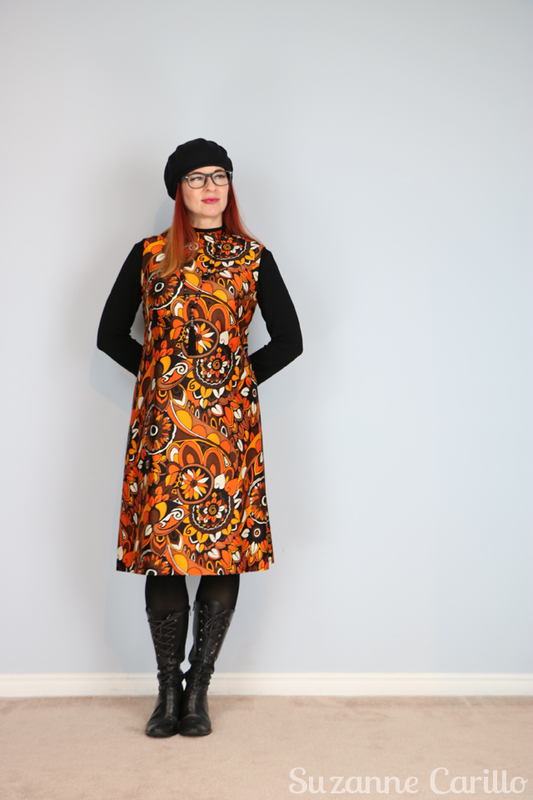 Love the psychedelic mod dress , to is fabulous on you with the beret and boots! I love your style, it is not all all senior ! I can not see you in a white coat performing dull tasks! A waste of your creative talents. off to the movies I go! Don;t worry about aging. It happens. Period. It is what it is. And you look so lovely. Always. Like in this beautiful happy dress. that dress is too freakin cute! The whole outfit is sooooo groovy!!! I cannot picture you in a white lab coat, ever. Your style is so fun, and beautiful, and colorful. Such a shame to hide it under a lab coat! One college summer I had a job researching and writing scripts for a World War II documentary. I thought I might die of boredom – and if I remember correctly, I wore jeans and a sweatshirt every day to work. So yep, my clothes fit the job! I’ve been very lucky that for the last 13 years I have had a job that allows me to wear what I want to work (within reason), and my work outfits are often appreciated by the students (I work at a university). I was rather peeved myself about being considered a “senior” at 55. Although I will not complain about being able to get 10% off my purchases at Talize, it’s annoying that there is no consistency about it – you’re a senior at 55 at this place, but not til 60 for another, and 65 for another. And you’re right, there should be an age at which you become a “Super Senior” and get 50% off stuff. Hi Suzanne, Ah, this post is timely! I just said to hubby the other day… so the benefit of getting older.. hmmm “getting wiser” senior discounts? I started getting the AARP magazine in the mail I think when I was 40! I receive Teen Vogue and don’t have a teenager! Anyhow, I love your colorful dress and those are great boots! I too found certain jobs stifeling as they didn’t appeal to me creatively and were quite mundane. I’m not sure at what age you are considered an official CARP (that’s a kind of bottom-feeding fish, right? ), Cadn. Asstn. of Retired Persons. Not eager to join a club with that name. Gee, why not? A local drug store chain starts discounts at 55. Woo hoo! Sooon. I think someone who’s 40 could ask a “youngster” at a ticket booth for a seniors ticket and get it. I remember when 32 seemed waaaay old. Heh. I LOOOVE that first photo of you. Groove on! You in a lab coat, you probably spilled stuff on it all day long to punk it up. No wonder you’re not in that job anymore. I want the Super Senior Discount. I may be in the minority, but I love getting older for exactly the reasons you listed about it being cool getting older. The older I get the more I embrace that side of me that has been digging to get out for the last 46 years. And I’m so thankful to have met women like you along the way who already embrace their cool creativity. It inspires me to keep going and pushing myself to own who I am and not be ashamed about that.